Howard passed away peacefully on Feb 05, 2018 surrounded by his family after living courageously with Alzheimer’s for many years. Howard was born on October 11th, 1936 in Frenchman’s Cove Newfoundland. He was pre-deceased by his sister Roseanne, his son Malcolm and his parents Jenny and Robert Thornhill. Howard is survived by his soul mate Sheila Bourgeois, his five children: Kathy, Geoff, Terry, Tracey, Giselle, as well as Sheila’s children, Duane, Deann and Dana. Howard is also survived by his brothers Art (Valerie), Larry (Sandy), Roeann (Aubrey), many grandchildren, great grandchildren, nieces and nephews. Howard enjoyed a great game of hockey, playing his harmonica and accordion, fishing and spending time with his family and friends. His smile would light up a room and in his last years he was often referred to as the “smiling gentleman”. His sense of humor and his one liner come- backs were a part of his charm. 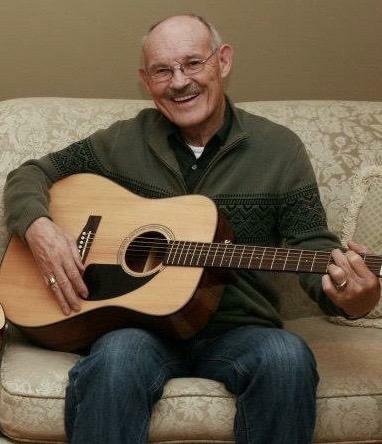 He loved to dance and his 80th birthday was spent with his family and friends laughing, dancing and singing to Sheila’s uncle, Don Hibb’s music. Howard will be missed by all of the people who’s lives he touched throughout the years. A service and a celebration of the wonderful man he was will be held this summer in Grand Bank, Nfld. Messages and condolences may be left at tricitycremations.com.